The Manage page is where you can find an overview of all of the links you've created in Easy Affiliate Links. Click on the blue Create Link button to create a new one or use the icon to edit an existing link. Name - How to identify the link in the backend. This is not shown to visitors. Description - Optional description for this link. This is not shown to visitors. 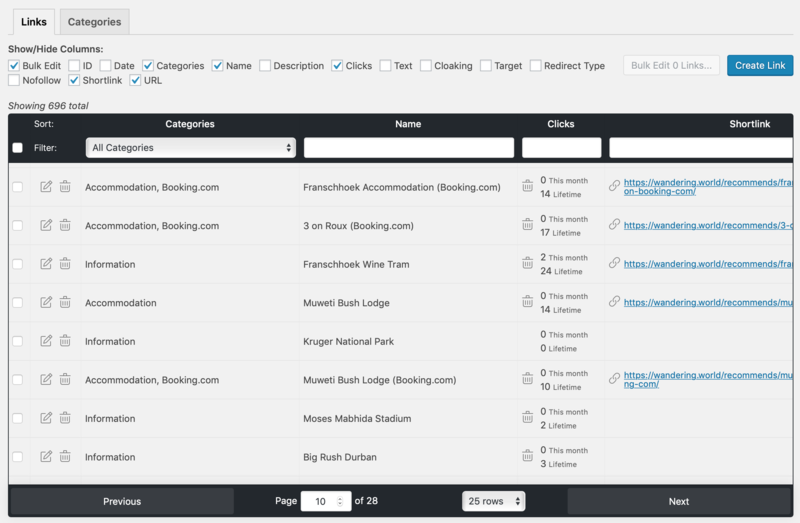 Categories - Optional category to group links. This is not shown to visitors. 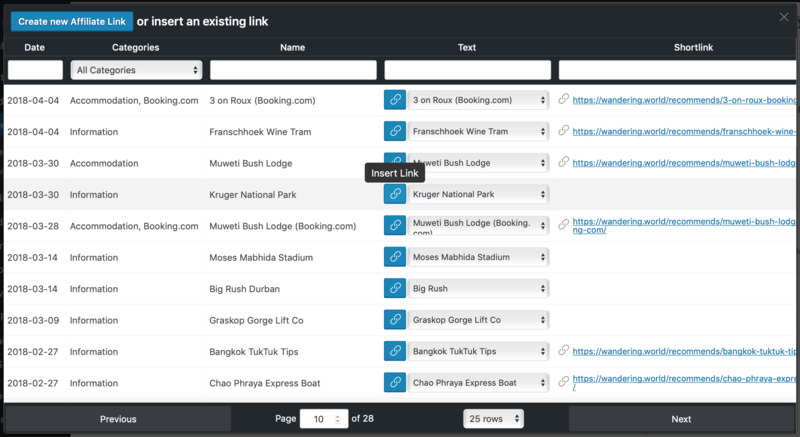 Link Destination URL - URL where you want your visitors to end up after clicking. Should start with http:// or https://. Link Cloaking - Wether or not to cloak this link. A cloaked link will show up to your visitors as http://yourwebsite.com/recommends/abc instead of the full affiliate link they are being sent to. Some affiliate programs (like Amazon) do not allow this. Default Link Text - Default text to show when you add a link (the clickable part). You can add multiple variants here for easy access when adding links to a post. Target - Wether to open the affiliate link in a new tab or not. Redirect Type - Redirect type to use for the cloaked shortlink. Nofollow - Wether or not to add the nofollow attribute to affiliate links. 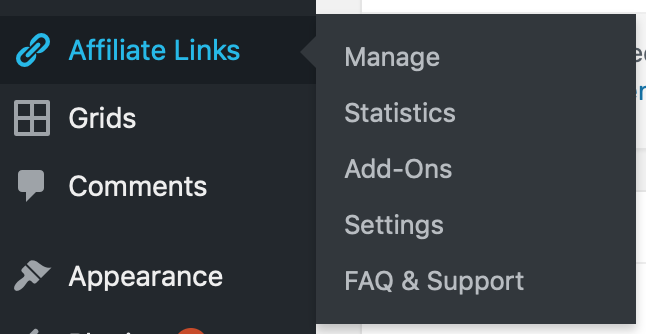 When writing a post, select the text you want to make an affiliate link or just directly click on the blue Easy Affiliate Links icon in the visual editor to add one. 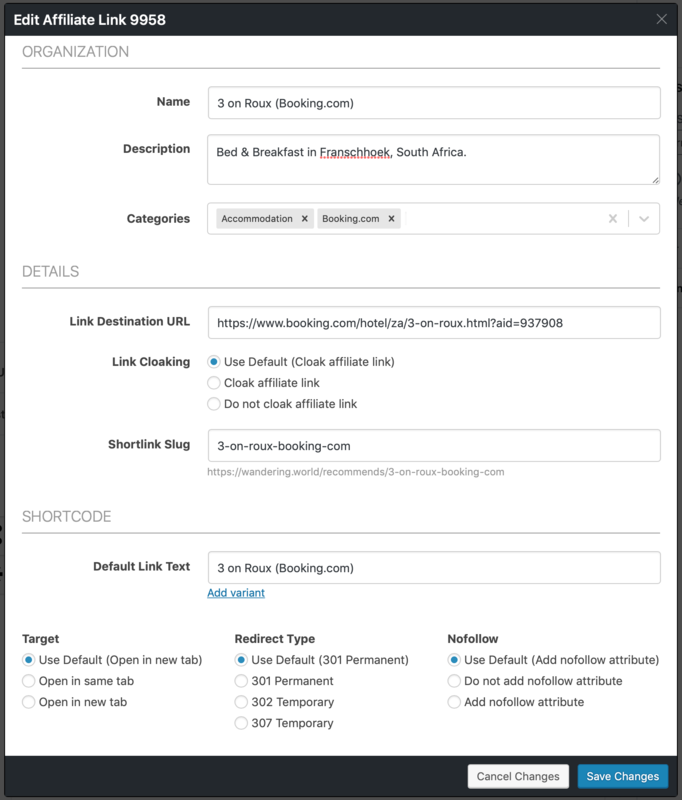 This will open up a modal listing all affiliate links on your website. Click on the blue link icon to add one or use the Create new Affiliate Link button to create a new one.